Zoetrope is a text file viewer that uses very little memory to run. It reads text files as “pages”, rather than reading the entire file into memory at once. It never holds more than one page in memory, regardless the size of the file. 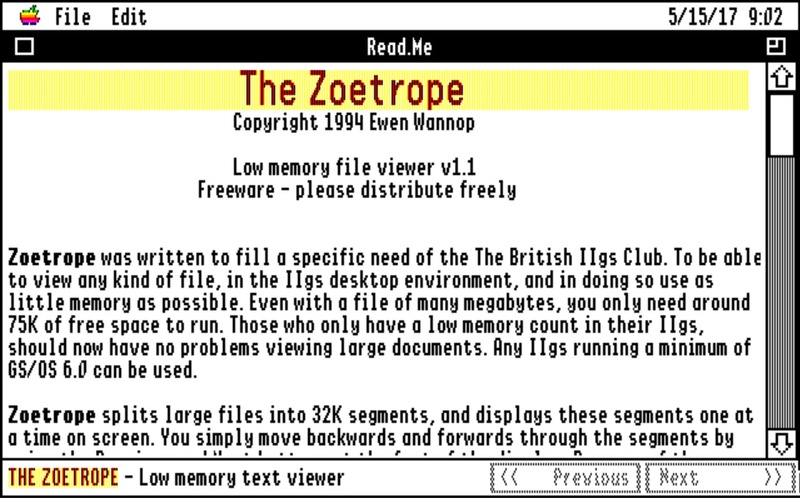 Zoetrope was written to fill a specific need of the The British IIgs Club, to be able to view any kind of file, in the IIgs desktop environment, and in doing so use as little memory as possible. Even with a file of many megabytes, you only need around 75K of free space to run. Those who have little memory in their IIgs, should now have no problems viewing large documents. Any IIgs running a minimum of GS/OS 6.0 or later can be used.